Do you ever get a bit bored of sandwiches and soup for lunch options? I do. On a rainy Sunday recently I had an array of wraps and rolls that could do with using up, a variety of salad and sandwich fillings and just really didn’t fancy another same old sarnie. 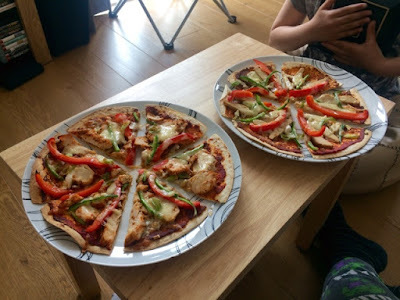 It was a bit of a miserable day and were all about to sit down and settle into an afternoon movie together as a family and I thought wouldn’t it be nice if we had something we could pop down on the coffee table and help ourselves to while we’ve got the film on and so tortilla ‘pizzas’ became a thing in my house. I posted a picture of my efforts on Instagram and Charlotte from Charlotte’s Lively Kitchen (one of my new fave blogs to follow) asked the following question: ‘I keep thinking of trying this but I worry that the tortilla isn’t strong enough to hold as a slice. Is it?‘ The answer is yes. I was a little unsure as to how this would pan out but I found that the tortilla actually crisped up quite nicely in the oven, giving the pizzas a good solid base so you can hold a slice without dropping it all over yourself. 1. Don’t overload with ingredients. 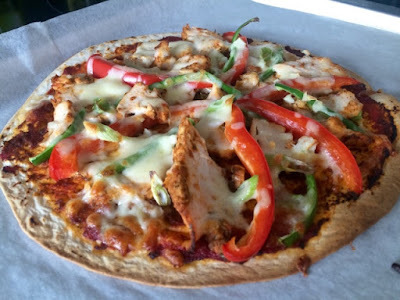 The more you pile up onto your pizza the less likely the tortilla is to hold up. 2. Don’t soak your tortillas in loads of sauce. Rather than passata that I might use on a normal pizza base I just used a spoonful of tomato purée and a spoonful of pesto as the sauce on these. Neither of these are too wet allowing the tortilla to keep it’s shape. The rest of the toppings are entirely up to you. 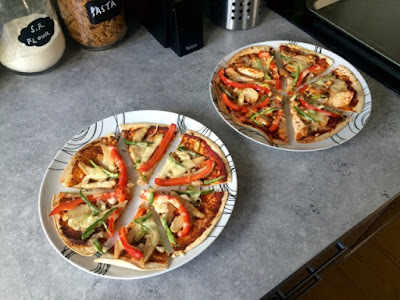 I made two pizzas as my step-daughter is still going through her vegetarian phase, although good on her she has stuck to her guns and kept it up so maybe it’s not just a phase. We had one piri piri chicken pizza and one quorn ‘chicken’ pizza to share between all of us but there’s an endless amount of different topping combos you could choose. I tend to find that most things you’ll buy for wraps and sandwiches will work well on top of a pizza. 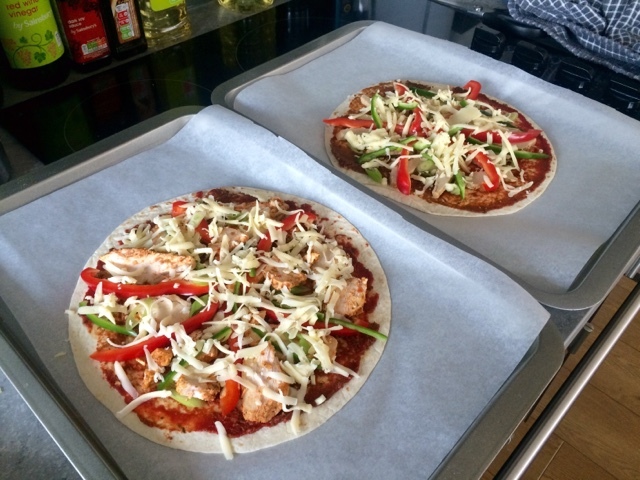 I really enjoyed having these for our movie afternoon lunch and I think they’d make a great dinner served with some salad as they’re so much lighter than a normal heavy based pizza so you don’t need to feel too guilty about having one all to yourself! 1. Preheat oven to 200ºC. Line two baking sheets with greaseproof paper. 2. Spread the tomato purée and pesto onto the two tortilla wraps, mixing as you go. 3. Evenly scatter the peppers, garlic and chicken pieces across both pizzas. If you’re making a meaty and a veggie version like I did, obviously keep the chicken and quorn chicken separate. Evenly sprinkle the grated cheese over the top. 4. Bake in the oven for approx. 10 minutes or until the cheese has melted and the edges of the tortillas look golden and crispy. 5. Remove from the oven and cut into slices. 6. Serve up to a hungry family as a great movie munchies.